Trần Phương Lan has always cared for children with needs. However, one child she came across seemed to have extremely special needs. 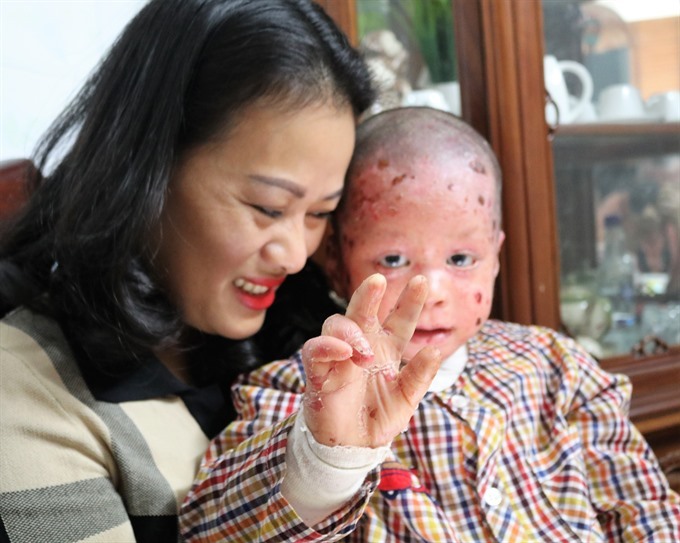 The little boy had a skin disease that caused him to come out in blisters and need lots of care. Trần Phương Lan took her home to be her own child, even though she is a single parent. HÀ NỘI — A phone call to Trần Phương Lan from the National Children’s Hospital four years ago would change her life forever. Lan was volunteering helping children who suffer from epidermolysis bullosa (EB). This disease affects the skin and causes sufferers to have intense blisters all over their bodies. Children who are born with the condition are known as ‘butterfly babies’ because their skin is as delicate as a butterfly. Lan is no medical expert, she is the co-founder of the EB Child Patients Club, and is often the first person people call when they have a new case. But when she answered her phone to the hospital in 2014, this wasn’t any ordinary case. A baby had been abandoned at the hospital with what medics thought was the worst case of EB they had ever seen. “Patients with EB have extremely fragile skin. It blisters and tears from minor friction or trauma,” Lan said. One in 20,000 children is born with this genetic disease. Lan, who has been volunteering with sick children for most of her adult life, first became aware of the condition in 2010 when she helped care for a little girl who had the disease. So moved by the child, she set up the support groups for other parents with children suffering from EB. But this latest butterfly baby she was helping was different. His parents had abandoned him, and he had no one to look after him. Then her daughter Tuệ Anh spoke up. “What if our family is a bit wealthy, we can adopt him?” she asked. Four years later, Nguyễn Hồng Vũ, or Kem as he is affectionately known, is part of the family, sharing their small home on Lê Duẩn Street. There is no treatment or cure for EB. Daily wound care, pain management and protective bandaging are the only options available. Every two days, he is washed with saline, applied medicines and wrapped up in bandages. This costs Lan up to VNĐ7 million (US$300) each time. Two maids are hired to take care of Kem when she is away and his food needs to be nutritious and blended smoothly to reduce pain. “I want to give my son the best I can have. No matter how hard it is, there is always the way to overcome,” she said. Lan is so dedicated, she has sold properties to pay for his care. In 2010, she got to know a girl called Bông suffering the disease at an orphanage in Long Biên District where she volunteered. In the past 10 years, she has gone to 52 provinces helping parents of other patients. At present, her club is providing help for more than 30 EB children. Every month, medicine directly imported from Australia, is delivered in to each patient’s door thanks to donations. “Each patient needs between three to five tubes of medicine and up to ten tubes to the most severe case. Each box costs up to VNĐ8 million ($344), all from people’s donations,” Lan added. “If I have a wish, it would be a stable donation so that my children can have more bandages and medicine to use. Only good care can help them grow up,” she said. Her efforts were recognised by Hà Nội People’s Committee. Early this month, she received the title Outstanding Citizen of Hà Nội. A great honour, but Lan finds inspiration to continue the work she does from elsewhere. Lan was volunteering helping children who suffer from epidermolysis bullosa (EB). To volunteer for something means to be willing to do it without being paid. This disease affects the skin and causes sufferers to have intense blisters all over their bodies. Blisters are sores on the skin, caused by rubbing. Intense blisters are fierce blisters. Something that is delicate can easily be hurt. The co-founder of a club is a person who starts it along with another person. If a baby is abandoned, it is left somewhere with no one caring for it. Medics are people who provide medical care to others, such as doctors, nurses and emergency workers. If something is fragile it can easily be ruined. Friction happens when one thing rubs against something else, causing discomfort. If this happens only slightly, it is minor friction. A trauma is a physical injury. A genetic disease is one that is handed down to you from your parents because it is in the genes. “What if our family is a bit wealthy, we can adopt him?” she asked. To adopt a child means to take it on and bring it up as if it is your own child. “As a single mum, I bear the full responsibility to take care of my daughter,” the 41-year-old said. A single mum is a mother without a husband or partner. To bear means to carry. Responsibility is the feeling that you need to make sure things are done correctly and if they are not, it is your fault. There is no treatment or cure for EB. A cure is a treatment that makes you better after you catch a disease. Daily wound care, pain management and protective bandaging are the only options available. Bandaging involves wrapping a bandage around a wound. Every two days, he is washed with saline, applied medicines and wrapped up in bandages. Saline is a liquid containing salt. Nutritious means containing the goodness found in food. “No matter how hard it is, there is always the way to overcome,” she said. Someone who is dedicated is very committed. An orphanage is a place where children whose parents have died, live. Every month, medicine directly imported from Australia, is delivered in to each patient’s door thanks to donations. If something is imported, it is bought from another country. Donations are gifts, usually in the form of money. “Each patient needs between three to five tubes of medicine and up to ten tubes to the most severe case. If something is an inspiration it gives you the energy to want to go out and do something positive. And that is the only motivation this mum in a million needs to hear. Motivation is what drives you to want to achieve something. A mum in a million is a very special mother. Two letters that stand for the disease epidermolysis bullosa. Women who help with household jobs. A certain type of insect. 1. EB; 2. Mum; 3. Maids; 4. Butterfly; 5. Blisters.